Buy Ricola Swiss Herbal Sweets Liquorice - 45g in the UK from our online shop or directly from our independent Scottish store. The intense, flavoursome liquorice taste is composed of high quality liquorice extract and natural star-anise flavouring that make it unmistakable. The intense, flavoursome liquorice taste is composed of high quality liquorice extract and natural star-anise flavouring that make it unmistakable. Combined with the proven 13-herb blend, Ricola Liquorice is refreshing and pleasantly mild. We sell real Ricola and other Sweets directly from our shop in Scotland and online throughout the UK. View more products from Ricola. Where can you buy real Ricola Licorice 45g safely online? If you are wondering where you can buy Ricola Swiss Herbal Sweets Liquorice - 45g safely online in the UK, then shop with us. 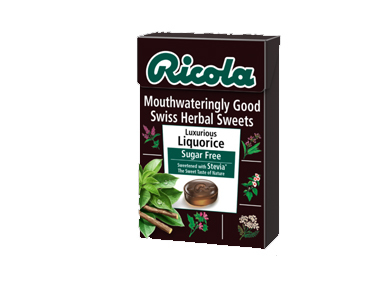 Ricola Licorice 45g - Ricola Swiss Herbal Sweets Liquorice - 45g in Sweets and Confectionery.